Below are some details of the known farms around the hamlet of Burcott and north of Wing, their owners, and tenant families. If you have further information to add, please let me know. Burcott House Farm was the home of the ADAMS family. Henry Charles Adams is listed in directories and census records as running this farm over the 1847 to 1891 period. He was not the first Adams on this particular farm though, as his grandfather Robert and father Thomas had also been farmers (Robert had 9 horses, 1 wagon and 3 carts at the time of the 1798 Posse Comitatus). While Thomas had a large family there were only two surviving sons, and as the elder was charged with Thomas’ murder in December 1837 it is perhaps fortunate (or merely indicative of the family relationships) that the younger was the primary beneficiary of Thomas’ will. This will tells us several different things about the farm. Firstly, Thomas had himself inherited it from his father, and the land had been held by the family dating back to at least inclosure in 1797 as the will specifically refers to the plot numbers on the inclosure map. Thomas in turn left that freehold and copyhold land in Wing (plus freehold land in Stewkley) to his son Henry Charles, who would have been just 14 when his father died. The land (with cows and grain) was to be held in trust for him until he reached the age of 21 in early 1845. In the 1841 census he is not in Wing at all, but there is a Richard FOUNTAINE farming at Burcott that year – this is Henry’s brother-in-law who was also one of the executors of Thomas Adams’ will, presumably farming at Burcott in Henry’s stead until he came of age. The Fountaine family owned Lower Wingbury Farm in south Wing. The court cases against William Francis Adams also tell us a little about the farm. It had both sheep and cows (Thomas Adams had sold some bullocks on the day of his murder), with a cow-house at Fox-hill (Fox Covert?) which was 1,000 yards from the farmhouse. Poachers in the area of the cow-house were relatively common. Running from the cowhouse towards the main house lay 150 yards of moorland, then a turnip field with a fishpond, then New Barn 400 yards from the cowhouse, then another field known as “Broad-stitching”. Horses were used on the farm and evidently were numerous enough to warrant a horsekeeper, George BONE. Other agricultural labourers working for the Adams family included Thomas WORSTER, William COLLIER, John HOPE, and house servant John SHARPE. The ADAMS family photographed outside Burcott House in 1869 following a family wedding. Interestingly, Thomas Adams’ will (written in 1835) notes that £400 was to be set aside and used to construct a “substantial farm house” on the estate at Burcott, however this directive was removed by codicil in 1837. One might surmise that a new farmhouse had been built in the intervening two years? The size of the farm fluctuated very slightly over the years Henry ran it, but was approximately 220 acres and provided employment for up to 13 workers. Some of those workers lived on the farm and included Joseph LATHWELL and Thomas LOVELL (both in the 1851 census). Upon Henry’s death in late 1891 his youngest son Herbert Walter, who had been working with him on the farm, inherited it. He is listed in directories from 1895 to 1928, including on the 1901 and 1911 census. In 1901 the household included two domestic servants for the usual family of three, and the dwelling had ten rooms in 1911. Herbert only had one child, a daughter, so perhaps the legacy of Burcott House Farm did not continue. Within Burcott there seems to have been several name changes and very similar house and farm names which can make it difficult to pinpoint exact locations. The farmhouse for Burcott House Farm owned by the Adams family is still in existence and still named Burcott House however its name does not appear on the current OS map. In 19th century maps it appears named as Burcott Farm. Slightly to the north of Burcott House is the current-OS-named Burcott Hill House, however this is a relatively new (20th century) house previously just known as Burcott Hill. Another “imposter” is the current-OS-named Burcott Lodge at the south end of Burcott which appeared as Burcott House on post-WW1 maps (1925 to 1959) and as Burcott Cottage on 19th century maps. Burcott Hall Farm – is named in the census records from 1861, when widow Jane SMITH, an “immigrant” from Houghton Regis and presumably assisted by her five sons, was farming it. John and Jane Smith had previously been recorded as farmers of Burcott in the parish registers of 1852 when there is a “job lot” baptising of their 5 children, which suggests the family had arrived in Wing sometime in the July 1851 to July 1852 period. In 1861 the farm is recorded as being 300 acres employing 8 men and 4 boys in total, while the property next door is described as Newbarn Farm (elsewhere Red Barn, or Burcott Barns) and is occupied by one of Jane’s sons who is listed as an agricultural labourer rather than farmer. The size of Burcott Hall Farm decreased under Jane’s tenancy – in 1871 it drops to 220 acres employing 5 men and 3 boys, and in 1881 it was 200 acres. Jane died in 1889 aged 79 and leaving an estate of £828. Despite all those sons it looks like the farm didn’t stay in the family – in the 1891 census William RICHARDS is listed as bailiff of Burcott Hall, then Arthur Somes HELEY (the son of corn merchant James Heley of Hollybank farm) is recorded as resident/farmer in the 1895 Kellys directory and subsequent census and directory entries through to 1924. The 1928 directory lists Thomas KING and Samuel LAWRENCE as smallholders of Burcott Hall Farm. In 1935 the entry for Thomas King has been replaced by Frederick ROBINSON, and Frederick has gone by 1939, although Samuel is still there. Mount Pleasant – The 1841 census records Joseph GRIFFIN as resident farmer at the approximately 180 acre Mount Pleasant Farm (along with Joseph BRUSHWOOD also living on the farm and working as a drover). It is likely Joseph had been there for at least a decade – based on his children’s baptisms he had been farming in the Burcott area since 1832 at a minimum – but it would seem the family subsequently moved out of Wing as there is no sign of them in later decades. Instead it was the BIGGS family that had an enduring relationship with this farm. Edward BIGGS had been listed as a farmer in Burcott since at least 1837, and by the time of the 1851 census had taken over Mt Pleasant. That year he employed 9 labourers – this count remained fairly constant over the 35 years of his control, with most records showing the farm employed 6 men and 3 boys. Edward died in 1883 and was succeeded by his son Edward William BIGGS. The 1903 directory lists Edward farming jointly with William, his brother, but by 1907 the brothers had retired, Edward William to Burcott Villas and William James to Rose Cottage along with two of their sisters. William Cornelius BRADSHAW took over and remained at Mt Pleasant until at least 1935. Morris ROBERTS is listed at Mt Pleasant in 1939. Burcot Old Farm – is mentioned in insurance records from 1821 when John CULVERHOUSE held insurance on this farm, although I’m not sure exactly where in Burcott it was. However John was not the only Culverhouse farmer in Burcott – he appears in the 1798 Posse Comitatus (5 horses, 1 wagon, 3 carts) along with his brother William (4 horses, 2 carts), and John’s son George was also a farmer in Burcott in the 1810s. I haven’t found any mention of a farm name associated with either William or George so it’s not clear whether they farmed with John at Burcot Old Farm or not. By 1851 John had retired to the almshouses in Wing, which suggests his farm was not a particularly lucrative business. 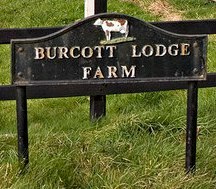 Burcott Lodge was likely also known as Burcot New Farm as records for William WYATT can be found with both names in the 1810s period. The land itself was owned by Lord Chesterfield, with taxes being assessed at £17 in 1830. The parish records show William Wyatt, farmer of Burcott Lodge, baptising children in 1813 to 1816, the Sun insurance records have him of Burcott New Farm rather than Burcott Lodge in 1819, but later records all revert back to Burcott Lodge. William also pops up giving evidence in the Adams trial in 1838 and on the 1841 census, while a widowed Esther Wyatt of Burcott Lodge, late of Grendon Underwood, left a will in 1810. William and his wife Ann evidently left Wing for Winslow some time in the 1840s, but both were buried in Wing in 1849. The next known tenant farmer of Burcott Lodge was Joseph E SWANNELL who appears in the 1851 census. The farm is noted as being 260 acres and employing 13 labourers. Next up, and with the longest known tenancy, was an immigrant from Scotland, Robert VALLENTINE. The first mention of him at Burcott Lodge is baptising his children James and Mary Elizabeth in 1858 but he seems to have arrived around 1855. The progress of the farm can be judged in subsequent census records – 263 acres and employing 6 men and 3 boys in 1861, 308 acres employing 10 men (including John Jennings who lived on the farm) and 4 boys in 1871, and 308 acres employing 8 men and 4 boys in 1881. Robert died in 1898. Unmarried son George took over and is recorded in the 1901 census with quite the assortment of female boarders with him! 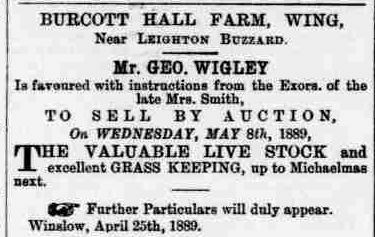 By 1911 George had moved on and sold the farm to Willage PAGE, butcher and farmer. Jumping forward a couple of decades, Burcott Lodge (complete with electric lights and chauffeurs rooms) was up for auction in late 1936 – it was described as a “first-class freehold hunting box” rather than a farm. On the modern OS map there is a Burcott Lodge Farm in Burcott’s north-west, and a separate Burcott Lodge at the southern end of Burcott, so it was probably this smaller property up for auction rather than the larger farm. Bernard Bradbury WINTER is listed as farming at Burcott Lodge in 1939. Ash Farm is found at the extreme northern end of Burcott and only appears as a named farm in the 20th century. Henry BONE is the resident in the 1911 census however he’s listed as a shepherd and worker which suggests he is neither the owner nor the tenant farmer of the property. William BADGER appears in the 1847 directory. Gabriel BULL is describes as a farmer when baptising his children in the 1839 to 1850 period, and appears in Burcott in the 1841 census and 1847 directory. Charles COTCHING is farming in Burcott at the time of the 1851 census (213 acres employing 11 labourers). The Cotching family may have had farm connections in Wing prior to this – a Robert Cotchings of Linslade had married an ADAMS (of Burcott House Farm fame) girl in 1768, and there are some insolvent debtors papers held at the Centre for Buckinghamshire Studies regarding (the same?) Robert Cotching, dealer of cattle formerly of Burcott but of Linslade in 1801 when the papers are dated. Widowed 34-year-old Eliza EMERY is in the 1851 census with 105 acres and employing 5 labourers, one of whom is James GREEN. HELEY Brothers are listed in the 1869 directory – this would be James William and Thomas Somes, in their early 30s at this time. The various generations of Heley men had fingers in the agricultural pie throughout Wing – James’ son Arthur Somes later took over Burcott Hall Farm. Widow Sophia PRENTICE appears in the 1861 census farming 136 acres and employing 3 men and 2 boys. In 1855 Sophia’s husband Thomas is recorded as a farmer of Burcott when baptising their daughter, however he was perhaps better known in Wing as proprietor of the Red Lion. Thomas was the eldest son of John Prentice senr of Waterloo farm in Ascott but he clearly farmed separately to the rest of his family. John WOOD appears in the parish registers in the 1818 to 1825 period baptising his children.